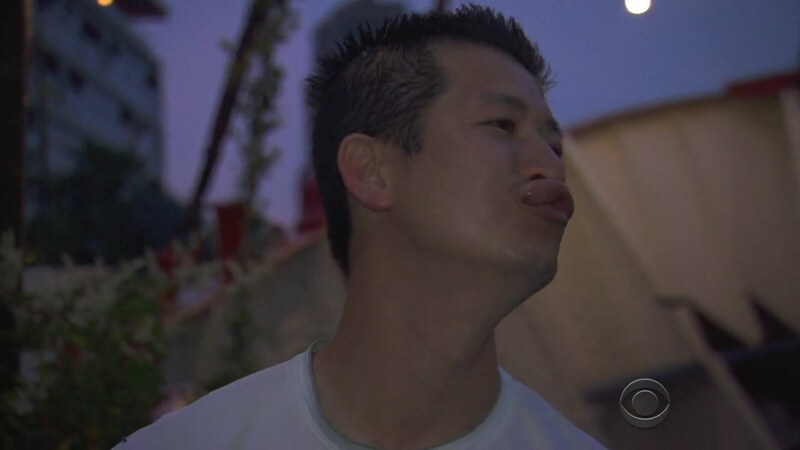 Recap: The Amazing Race 27, Episode 7 – "Mosquito must have gotten my lip, rearranged my face." James Earl wants to switch to the other side of the Detour, but Denise says they should try two more times. They finally get the thumbs up after their 18th attempt. They head to the Mat and Phil tells them they are still Racing. All the teams are given tickets on a train leaving Paris at 7:22pm for Rotterdam, Netherlands. But Justin & Diana manage to get on a 4:19pm train, Joey & Kelsey get on a 4:53pm train via Brussels and Cindy & Rick and Tiffany & Krista get on a 5:16 train. Tanner & Josh decide to do some sightseeing while waiting for the 7:22pm train. Justin & Diana arrive in Rotterdam and head to Vessel 11 based on a provided picture. But they find teams won’t be departing until at least 5am the next morning when teams will be released in 15 minute intervals. 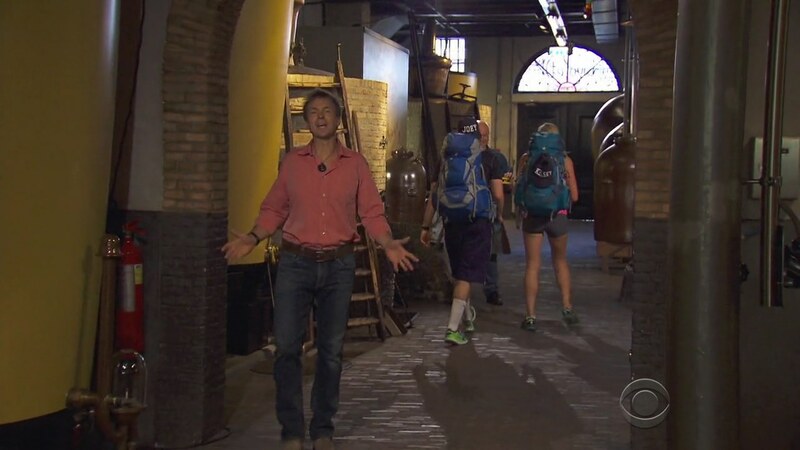 As Tanner & Josh realize their sightseeing might have been a mistake, Cindy & Rick continue to believe they are traveling to Amsterdam and miss the Rotterdam stop which Tiffany & Krista correctly disembark at. A man finally clues #ChacAttack in and they get off at the Schiphol stop to get on a train that goes back the other way. All teams finally check-in at the boat where they will be spending the night. Justin & Diana and Tiffany & Krista cross the Erasmus Bridge, on foot, at the same time. Cindy & Rick, instead, take a taxi to the terminal. Justin and Diana argue. Tiffany & Krista are in first place as they arrive at the windmills and find the Road Block: Who wants to pick the sunflowers? 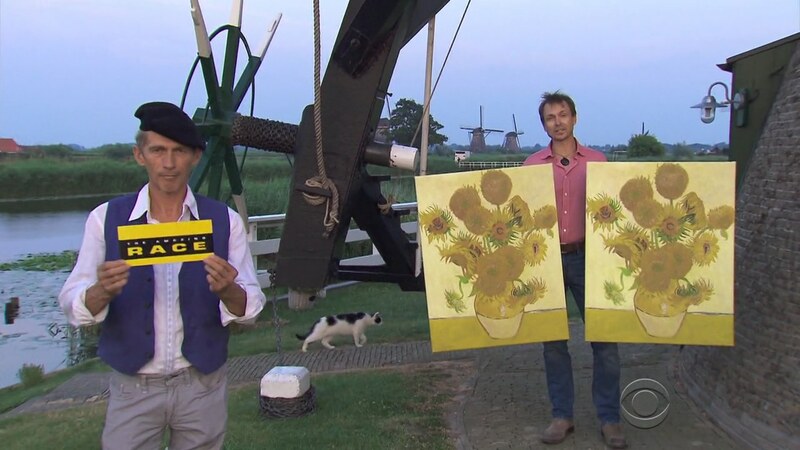 For this Road Block, teams will search the windmills for an exact replica of Van Gogh’s Sunflowers. Krista, Diana, Rick and Joey decide to do the Road Block. Joey gets it on his first attempt. Teams must now calculate the difference between their highest heart rate recorded on the last Leg and their heart rate after this Road Block. They must then pick up that number of tulips and deliver them to receive their next clue. Rick gets the correct painting on his 2nd attempt and Krista gets it on her 3rd attempt as Tanner and Logan arrive to start the Road Block. Joey & Kelsey deliver their tulips and must now make their way by water taxi to the Nolet Distillery, the home of Ketel One Vodka. Denise arrives to start the Road Block as Diana and Tanner get the correct paintings after their 3rd attempts. Denise also gets it on her 3rd attempt while Logan is last after her 4th attempt. Joey & Kelsey arrive at Nolet Distillery and find the Detour: Ship or Skip. 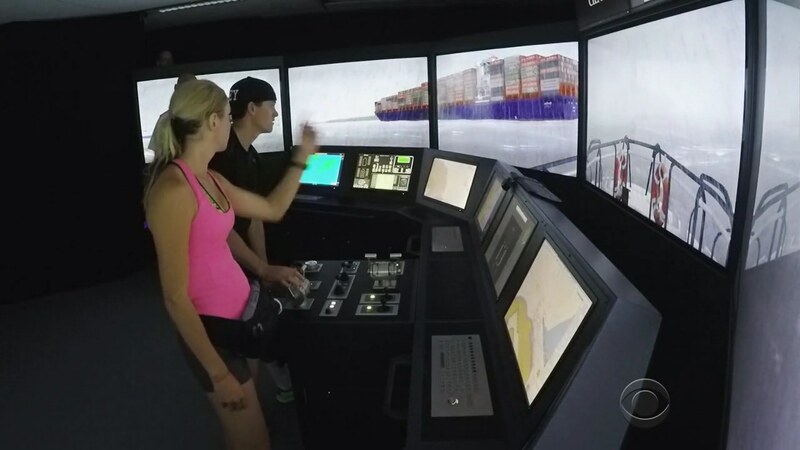 Harbor… in a training simulator at Millenium Tower while finding two specific vessels in under five minutes. They must deliver a pilot to the first ship and save the second ship after receiving an SOS. In Skip, teams must performing a clapping routine while playing Double Dutch for 45 seconds. Teams must travel to either Detour by tram. But Rick decides he and Cindy should wait for a bus to take them to the tram. Kelsey & Joey are at the Ship Detour and fail two attempts. Justin & Diana take this as an opportunity to get back into first, but they fail their first attempt. Cindy is frustrated, but she and Rick finally get on a bus. Tiffany & Krista head to the jump ropes as Kelsey & Joey come very close to finally completing their challenge. Cindy & Rick finally arrive at Millennium Tower as Tiffany & Krista complete the routine on their 2nd attempt. 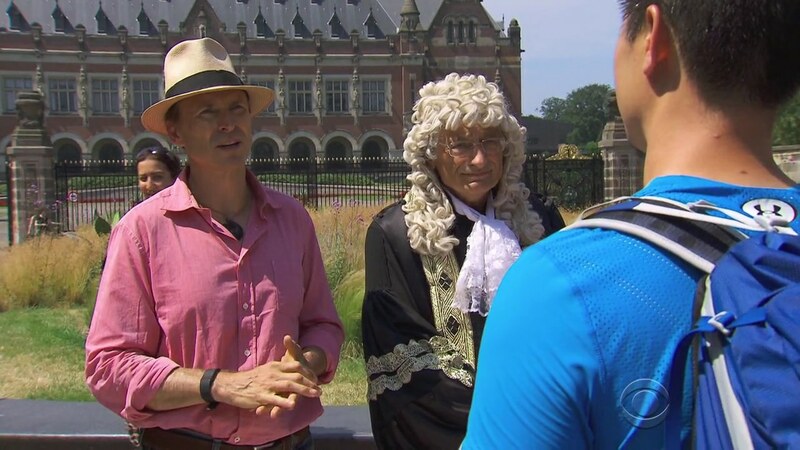 Teams must now travel by train to The Hague and the Pit Stop for this Leg, the Peace Palace. Justin & Diana and Joey & Kelsey finish the Detour as the other teams all arrive. Justin & Diana get to the train station first and hop onto a train before Tiffany & Krista arrive. That gets them to the Mat first where Phil officially checks them in as Team #1. Phil asks them for their step count today and their total of 31,873 steps will be turned into $31,873 from Fitbit. The higher heart rate between them at this moment, 89, will also turn into an 89 minute massage which they will enjoy right now. Back at the Detour, Tanner & Josh and Logan & Chris are next to leave. They step on the Mat as Teams #4 and 5 respectively. It’s between Denise & James Earl and Cindy & Rick. Cindy & Rick get on an earlier train that has two stops. Denise & James Earl decide to wait a couple of minutes for a train that goes direct. But that train ends up being delayed. Cindy & Rick arrive in The Hague and hop onto Tram 9 even though they knew to take Tram 1. That allows Denise & James Earl, who get on the correct tram, to step on the Mat in 6th. And that leaves Cindy & Rick in last and eliminated. So this was an exciting episode even if poorly designed. First of all, it is obvious the Zero Hour Pit Stop has likely replaced the Non-Elimination Leg which would necessitate a Speed Bump. And TAR with likely a lower budget as a result of the low ratings, needed to save some money, hence eliminating two extra tasks. And that’s alright, but it speaks to the current state of The Amazing Race mothership. The tasks themselves this Leg were fine. The windmill Road Block is totally a modified version of one of The Amazing Race Philippines 2‘s best tasks (the Bangui windmill Road Block in Ilocos Norte). Hehe. This one had the added element of attention to detail, but had the same physical nature. The Detour tasks were okay. The simulation is standard TAR fare and maybe it was just Tiffany & Krista, but the jump rope side of the Detour seemed very easy. So in that sense, maybe the Detour was unbalanced. But the Detour was unbalanced from the start because the ship simulation was a first come-first served task while the jump rope, on paper, was not. I’m sure they could have forced only one judge to watch all the teams, meaning they’d have to get in line too. But that still makes the Detour two completely disparate tasks. To make that get in line Detour worse, TAR had already separated the teams by 15 minutes at the start of the Leg. I don’t remember that ever happening before. It’s usually in groups. But that really did nothing except to stifle competition. I don’t know if it’s just to make things easier for TAR production and logistics by not having teams all bunched up at tasks. But really, from a competition and television standpoint, having all teams competing side by side (and I’ve always said this) is always the best and most exciting scenario. Some of the best Legs ever have teams fiercely competing next to each other. There is really no need for staggered departure times except when used as incentive for teams to complete a task. Here, it was used as a way to design a linear Leg. Again, as it has usually been this season, the teams’ own mistakes are what made a poorly designed Leg actually be exciting in spite of it. And this Leg apparently only took four to five hours to run since teams left between 5 and 6 and finished around noon, at the latest. Simplicity continues at TAR. 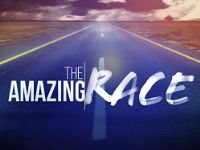 But like I said, it speaks to the current situation The Amazing Race is in right now. Denise & James Earl are still my favorite team right now. I’m glad they survived this Leg. It’s also great to see them competing hard. Not too many fun moments from this Leg as it was all business from them. Tiffany & Krista have really been Racing hard and it would be great to see them continue with the great momentum and win a Leg. It was pretty obvious early on that Cindy & Rick were the ones eliminated this Leg. When the show starts using pre-Race confessionals, you know a team is in danger. Not to mention them getting a bigger focus than usual this episode. Still, I liked them and hoped they could step it up while still being fun and hilariously happy-go-lucky. Like Rick’s lip or his random laughing in Zimbabwe while Logan & Chris fought. But they kinda took it too far this Leg. More so Rick who might as well have given up. Seeing them sitting at that bus stop did not look good. I wonder if there’s more to that than they made it seem just like last Leg, they left out the entire explanation on why Denise & James Earl were just wandering about. Anyway, I wish Cindy & Rick had much more urgency. They could’ve been a great team. Logan & Chris were pretty quiet this Leg, but it looks like they’ll be back in fun form next week. Tanner & Josh could’ve made a fatal mistake with that little sightseeing tour in Paris. But more often than not, especially after a Zero-Hour Pit Stop, there will be an equalizer at the next destination. So they got a fun few hours in Paris and are still in the Race. They haven’t been as strong lately though as they were in the beginning though. The rivalry angle seems to have now shifted to Kelsey & Joey vs Justin & Diana. Kelsey & Joey are alright. But Eeek! at their proclamation that “Justin & Diana OWN this season.” That’s actually very disconcerting. I don’t really want any one team to own a season ever. And Justin & Diana haven’t really been the most likeable so far either. A little bit too much playing up to the camera I think. Logan & Chris’ bickering is much more fun. 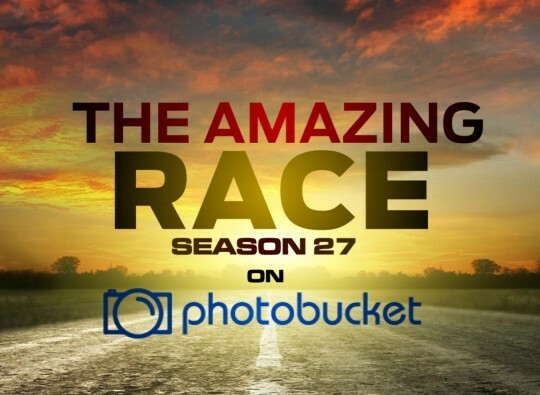 Since we’re halfway through the season, where do you think TAR 27 stands in the overall season rankings?